The only solution to our present health crisis is food enzymes. The study of food enzymes in nutrition and human health has been a ‘sore eye’ to both scientists and nutritionists alike. Much study was done in the early years but for some reason was not brought to light. Only now we see some glimpses of the need of food enzymes for maintaining and regaining our health. We will attempt to bring out the importance of enzymes as enzymes are the life force of our body. Without the life energy of enzymes we would be nothing more than a pile of lifeless chemical substances — protein, minerals, vitamins and water. In maintaining health, enzymes and only enzymes do the actual work. They are what we call in metabolism, the body’s labor force. What are ENZYMES? Enzymes are the key to radiance, longevity, and youth. According to Dr. Edward Howell, the grandfather of enzyme therapy, an enzyme is “…a protein molecule with electricity running through it…”. Each one of us is given a limited supply of bodily enzyme energy at birth. This supply, like the energy supply in our new battery, has to last a lifetime. The faster we use up our enzyme supply– the shorter our life. A great deal of our enzyme energy is wasted haphazardly throughout life. Heat of Cooking DESTROYS ALL Enzymes! The habit of cooking our food (several degrees of heat above our body temperature destroys enzymes) and eating it processed with chemicals; and the use of alcohol, drugs, medicines, vaccinations and junk food all draw out tremendous quantities of enzymes from our limited supply. Frequent colds, fevers, stress and exposure to extreme temperatures also deplete the supply. Even thinking requires enzyme activity. A body in such a weakened, enzyme-deficient state is a prime target for cancer, obesity, heart disease and practically all other degenerative problems. Such abuse often ends up in the tragedy of suffering and death at middle age. Today, even young children suffer from a lack of enzymes as we see many with childhood diseases and age related illness such as cancer. 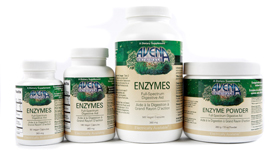 PLANT ENZYMES are the MOST EFFECTIVE and are… NOT DESTROYED by the high acidity of the stomach. They work within a 2 and 12 ph range. PANCREATIC ENZYMES are the LEAST EFFECTIVE. They work within a 6 and 8 ph range and are mostly destroyed by the acidity of the stomach. Enzymes MUST be in the body first before protein can be effective and before minerals can be utilized we need protein and before vitamins can be absorbed, we need minerals. The order of nutrients in the body. Health is Not a Matter of Chance… It’s Just a Matter of Choice! This entry was posted in Enzymes. Bookmark the permalink. Hi, I’m not interested in becoming a member for the moment. I just would like to buy your product. ¿Could that be posible? just go to … http://AvenaOriginal.info and purchase directly. Becoming a member has great advantages… A colorful and educational 96 page catalogue, rebates on personal purchases and rebates on other peoples purchases. people that you brag to when you amaze yourself with the results. See the marketing plan on the site.